One of the newest trends is gardening in containers. This is not to be confused with container gardening but is growing vegetables and herbs in containers. One of the main things that keep people from gardening is space. Compared to previous times people have far less yard area. Because of this, some have started to grow herbs and vegetables in containers and had good success. The only issue is when this first began, people would tend to do only one thing, like only one type of lettuce, etc. But as time has gone on, this practice has changed and people have started to get fancier with what they plant. Not only are they using different types of greens, but they are also using different colors too. Now, not only do these containers not look plain, but they are worth growing even if you do not use the vegetables in them. Or if you do use them, you can grow them without missing the annuals that you would have planted there. Vegetables and herbs are a great addition to any meal, but you can’t beat fresh ones and you can’t beat homegrown. Not only are they tastier, they are also healthier. Growing herbs and vegetables in containers is really easy. All that needs to be done is watering, harvesting, and maybe a little trimming. Containers add interest to your patio or yard. They can be used to break up an area or fill an empty spot. Regardless of where you put them, they will brighten up your patio. Let’s face it, another good reason to grow herb and vegetables in containers is that they look good. A quick search will give you far more ideas than you need to create many different combinations. 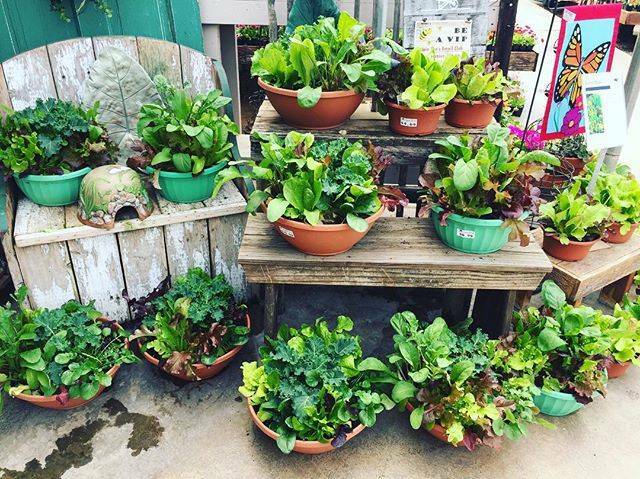 Have you ever tried container gardening or can you think of another reason why you should garden in containers? Comment below.